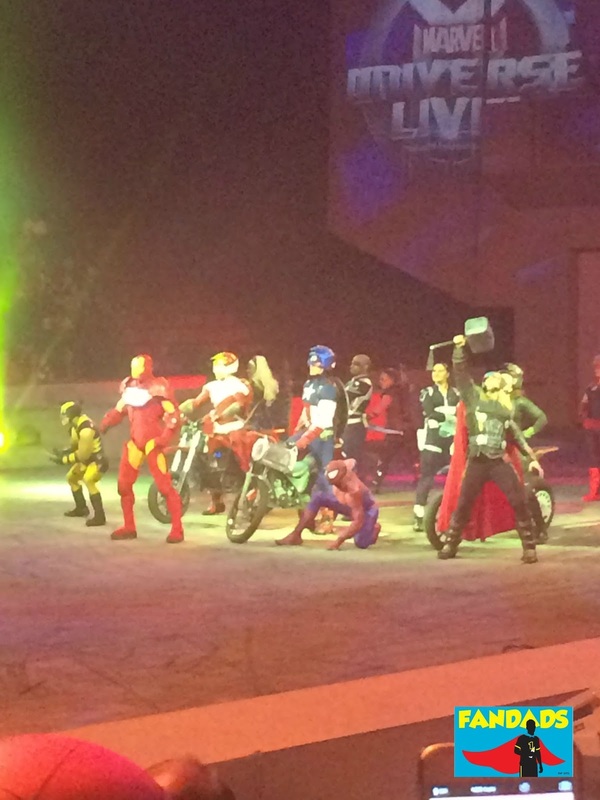 Have you ever wondered what it would be like to see your favorite superheroes in action right before your eyes? I know that many times when I would read my comic books I imagined myself in the middle of the action. I would see myself running around dodging explosions and lending a hand when I could. In reality though, I probably would be running around screaming my head off and trying not to get hurt. Well my friends, with the Marvel Universe Live show you can be up close and personal with the action, help out Iron Man during the show and not have to worry about a Hydra agent grabbing you, that is unless you run out into the stage area, which I suggest you do not do. In the Marvel Universe Live show, Thor smashes the Cosmic Cube to prevent it from destroying the world. When he smashes it "Fractals" of the cube spread throughout the world and into the hands of some of Marvel's greatest villains. With the Cosmic Cube broken Loki uses his scepter to collect a small portion of the dust from it to make a clone cube and if you know Loki, this can not be good. What comes next is a search that covers the world and an epic battle to end all battles. If any of that confused you let me clear it up; bad guy has evil plan and superheroes must stop him and his allies. Are we all on the same page now? Good. Since first hearing about this show I have been wanting to go to experience it. Recently there have been a lot of commercials on television about it and my little girl kept asking if we were going to go see it. All she kept talking about was wanting to wear her Black Widow costume to the show and helping fight the bad guys. I love how my little girl gets so excited about doing anything that is comic book related, because it just gets me even more excited. As we arrived at the show, sans Black Widow costume because she changed her mind, we were struck by the huge displays outside of the United Center showing us images of the cast of Marvel Universe Live. 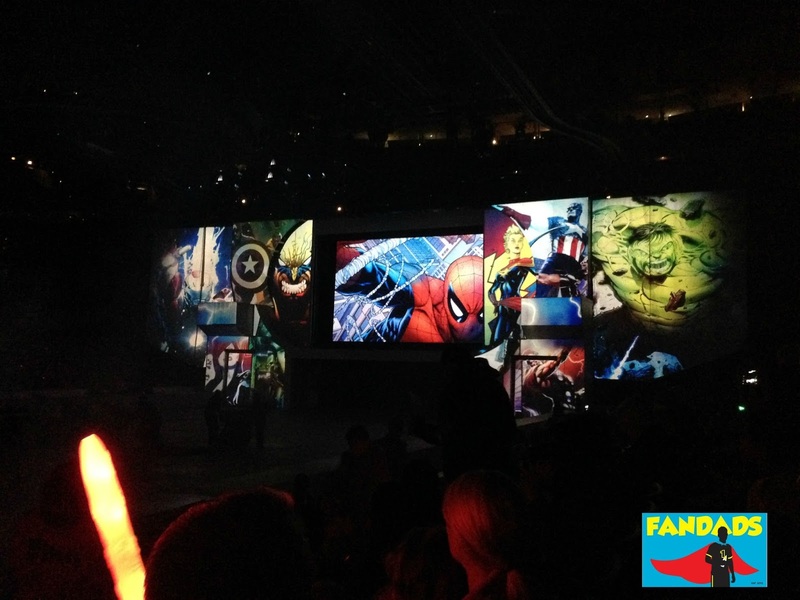 I can not tell you how my heart started racing when I saw the image of Spider-Man on that huge screen. 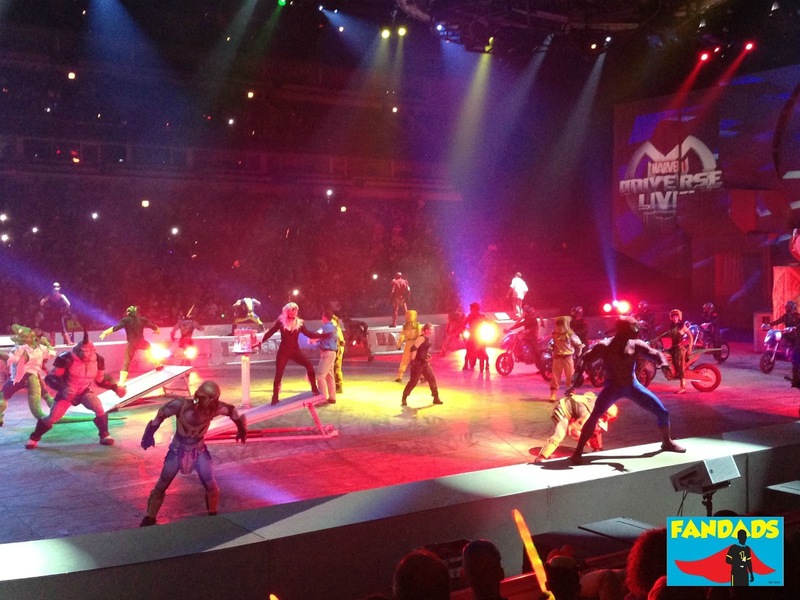 It was just awesome! One villain that I knew we would encounter at the show was the merchandise vendors. (Shaking fist) "Damn you, peddlers of fantastic wares that my kids want!" While there were a lot of cool items ranging from $6 up to $35, the one items that we wanted to get was the "Lectro Link". One cool thing about this show is that you can actually pre-purchase your items online and just pick them up at the vendor tables. I mean, you still have to wait your turn, but it's a little quicker since you don't have to pay at the table for your items. After defeating the "merchandiser" (pretty cool name for a villain, huh?) we took our seats and got prepared for the show to begin. The show was a lot of fun. There were epic explosions, fantastic fights and exposition, a lot of exposition. I think these parts might lose the attention of the younger ones in the audience, but the visuals that occur during might keep them focused until the next action scene begins. For a two hour show it went by at a good pace. The interaction between the characters was one of my favorite parts of the show. I already knew that Spider-Man would have a lot of funny lines, but the banter of Wolverine and Bruce Banner was hilarious. While Wolverine would jab Banner about the Hulk, Bruce stood his own and mentioned that Wolverine smelled like "wet dog" when he sweats. Oh yes, the characters in the show. The one character that was in the show that might be new to people was Captain Marvel. When she showed up my little girl sat up and asked me who that was. It was great seeing my little girl's excitement over this new superhero that she perviously did not know nothing about. If she is this excited now, I can't wait to see how she'll be when her movie is released in a few years. 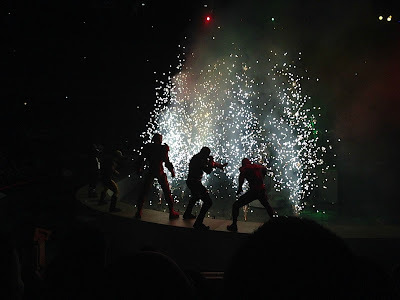 The fight scenes are very well choreographed and the motorcycle stunts are just fantastic. There were many times that I closed my eyes because I was sure that these motorcycles were going to crash into each other. From riding around doing wheelies, stopping on just the front tire of the motorcycle or jumping from platform to platform, it was pretty intense watching these guys do their tricks. I'm not going to say that this show is great for all ages, I would put that limit to maybe 4 years and up. I did hear some crying during the Hulk's big scene and the explosions made my son jump a few times. I think the action was a little too much for him, because he nodded off during the final 20 minutes of the show. He woke up just in time to see the Hulk do what his does best, smash. While the show is fun for the whole family there were a few things that stood out to me. During the Spider-Man/Thor section of the show they mentioned doing battle with the Sinister Six, but only five of the members were there: Green Goblin, Rhino, Doctor Octopus, Lizard and Electro. The Sandman was not around, but they had the Black Cat show up and interfere in the fight scene. One other part that irked me was the Lectro Link. There was a lot of talk about it during the show and the need for it, but I feel it would have been better to freeze the action and tell everyone when to turn it on. They did mention using teamwork, but if you have a sleeping toddler on your lap and a curious daughter that is asking you a question a minute, you might miss the cue to turn it on. 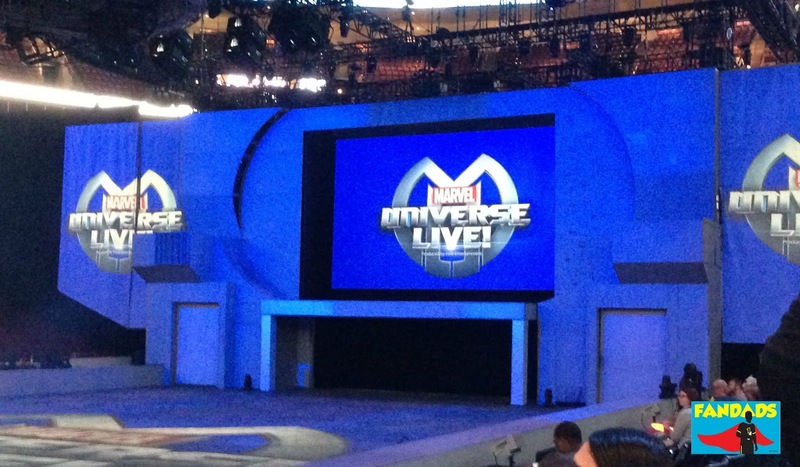 Regardless of me letting my geek flag fly, my family had a great time and can not wait to see this show again. 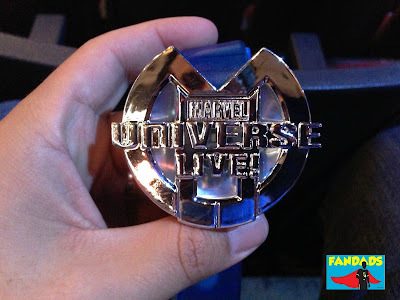 Marvel Universe Live is now playing at the United Center until Sunday and moves to the Allstate Area on September 18-20. Get your tickets here. Thank you for reading and enjoy the show. Learning what's new at the #TNTChicago event. The Fandads know that "Real Men Can Braid"
Choose a Side! The Resistance or The First Order. Having fun with The Good Dinosaur. Regrets of a Fanboy Action Figure Collector. Two steps forward, 100 steps back.